Reid M. submitted this photo and caption. It's been about five years since the last time DCI had a competition in Seattle. Needless to say whenever they have been here, I've made it a point to attend. This year, not only did the Seattle Summer Music Games return, but to my great excitement, this included the Cadets! Never in the Cadets' 84-year history have they ever performed in the Pacific Northwest, and it was only their seventh trip to the West Coast ever. I fell in love with the Cadets as a 15-year-old boy back in 1986; My history-teacher father had the rededication of the Statue of Liberty program on TV. I remember watching this amazing drum and bugle corps march onto the stage with the Statue of Liberty in the background, and proceeded to play beautiful Americana music with the most symphonic brassy sound that made the program exceptional to watch. I was an instant fan of the Cadets ever since. Because of Seattle being on the other side of the country, I've always assumed that the Cadets would never compete here. If I wanted to ever watch them in person, I've always assumed I would have to go and find them elsewhere. However this year, 25 years after seeing them on TV for the first time, not only did the Cadets come to town and compete at the Seattle Summer Music Games on July 2, they stayed two more days and marched in the Everett, Wash., 4th of July parade, only 10 minutes from my home! My oldest daughter and I followed them the entire parade route, loving every minute they were in town. It was great hearing all the "oohs and aahh's" of the people lined along the street, marveling that a nine-time world champion drum corps would come to their 4th of July parade. Afterward, the Cadets played an open stand-still concert in the park as a part of Everett's naval port city concert-in-the-park 4th of July celebration, before heading out to Boise and another DCI competition the next night. 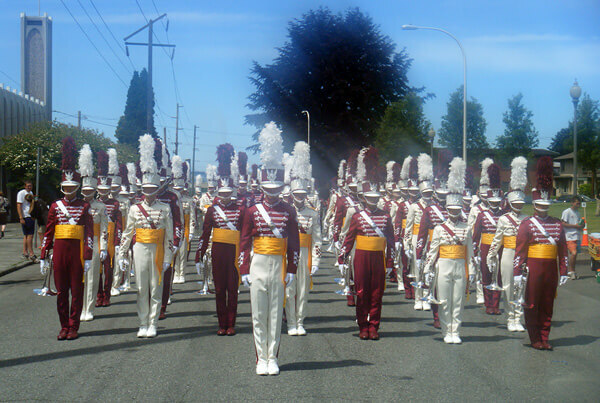 Because of the Cadets' two July 4th performances here in Everett, maybe there's a new crop of fans seeing the Cadets for the first time and becoming new DCI fanatics like I did so long ago? I know my daughter is hooked for good. Good luck to the Cadets, and thank you to DCI's Seattle Summer Music Games for returning to Seattle! Please come back every year!